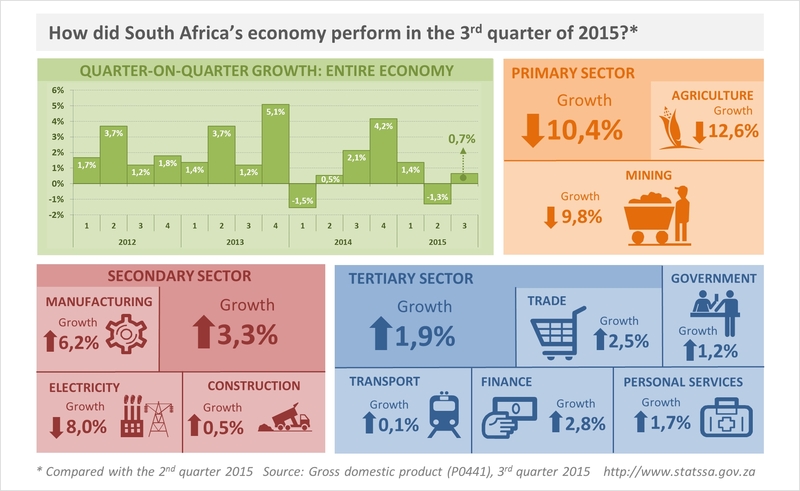 South Africa’s economy grew by 0,7% in the third quarter of 2015, according to preliminary estimates of real gross domestic product (GDP) released by Stats SA. Unless otherwise stated, growth rates are quarter-on-quarter, seasonally adjusted and annualised. After experiencing a 1,3% contraction in the second quarter, the marginal GDP growth in the third quarter staved off a technical recession. A recession is usually said to occur if a country experiences two consecutive quarters of GDP decline. The increase in overall economic activity in the third quarter was characterised by three of the ten main industry groups shrinking in size, while the other seven experienced some growth1. The agriculture industry experienced the largest fall in activity, contracting by 12,6%. Decreases in the production of field crops (such as maize, sunflower and sugar cane) contributed to the industry’s decline. Activity in the mining industry fell by 9,8%. Lower production in the mining of coal and other minerals contributed to the decrease. Electricity, gas and water supply was the third industry to experience a contraction in the third quarter, falling by 8,0%. This was mainly as a result of a decrease in the production and consumption of electricity. Electricity distribution in South Africa has been subdued this year, according to Stats SA’s latest Electricity generated and available for distribution release. The amount of electricity distributed was 1,2% lower in the first nine months of 2015 compared with the first nine months of 20142. These three industries can be regarded as being in recession. This was the third consecutive quarter of agricultural decline, and the second consecutive quarter of decline for both mining and electricity. The manufacturing industry grew by 6,2% in the third quarter. Increased production of various products, such as food & beverages and wood & paper, contributed to the rise in activity. This followed two consecutive quarters of contraction in manufacturing. 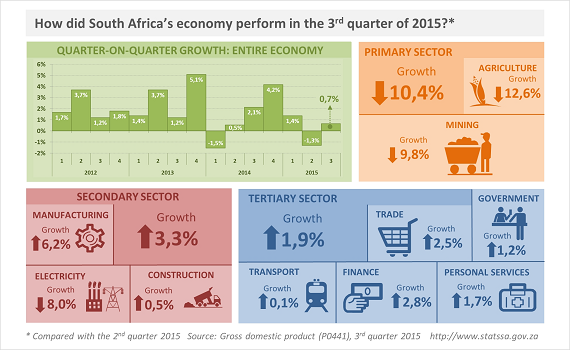 The other industries that experienced growth in the third quarter were finance (+2,8%), trade (+2,5%), personal services (+1,7%), government (+1,2%), construction (+0,5%), and transport (+0,1%). The South African economy last entered a recession in late 2008 and early 2009, when GDP declined for three straight quarters: the fourth quarter of 2008 (-2,3%), the first quarter of 2009 (-6,1%), and the second quarter of 2009 (-1,4%). • The unadjusted real GDP at market prices increased by 1,0% year-on-year. • The estimate of real GDP for the first nine months of 2015 increased by 1,5% compared with the corresponding period in 2014. • Nominal GDP was estimated at R1 007 billion for the third quarter of 2015 (the first time quarterly nominal GDP has exceeded R1 trillion). 1 Download the gross domestic product (GDP) release here.